P A W S O M E ! In protest against education policies announced by Ontario’s Progressive Conservative government, many of our students have opted to take part in the province-wide student walkout. With this walkout, we cannot stress the importance of our students staying safe and being cautious outside of school property (Bay and Algoma). As a safety precaution, Thunder Bay Police have been notified regarding the afternoon protest. Students who choose to participate will be marked absent for the classes they miss, and parents and guardians will be notified of their absences. We respect the right of our students to advocate for causes that are important to them. Our students recognize the significance of their education, and how it will help shape the rest of their lives. The #StudentsSayNo Movement alone has attracted over sixteen thousand followers, and has become one of the largest student organized campaigns we have ever seen. Open communication between student leaders/student groups and school administration has been incredible, prompting further discussion on various ways to still protest, while still remaining at school and attending class. Student safety remains our main concern and we want to ensure this is done in a responsible and safe manner. If you have any questions, please don’t hesitate to contact the school. The season of Lent begins today, and with it comes a long tradition of Lenten practices and spiritual reflection. Consider what you will do this Lent, to bear witness to your Catholic faith. 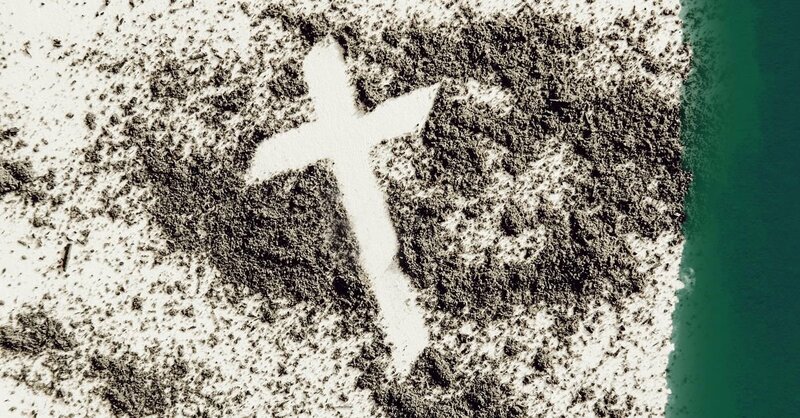 Catholics around the word are encouraged to pray more during Lent. Lent is also an ideal time to receive the Sacrament of Reconciliation in preparation of the most important liturgical celebration of the year – Easter. Catholics often choose to abstain from meat on Ash Wednesday, Good Friday, and all Fridays of Lent. Many Catholics combine almsgiving with fasting and giving to the poor. 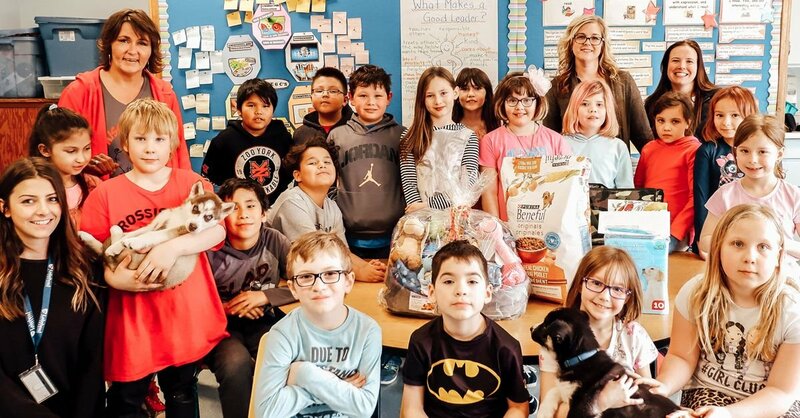 Please join all of our schools – staff and students, in supporting our food drive, which is occurring throughout this Lenten season. All donations will go to the Regional Food Distribution Association. 8: 15 a.m. – 4:00 p.m. 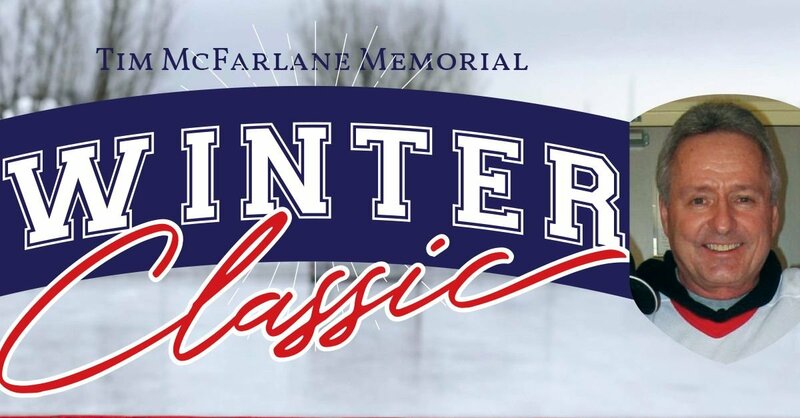 Cheer on our Senior Elementary Players and honour the memory of our friend, colleague and teacher, Mr. Tim McFarlane. Donations will be collected at the door, care of the Tim McFarlane Awards Trust Fund. Wear your best school apparel or Red Wings Jersey. Please consider donating any gently used equipment: Helmets, Gloves, Skates and Sticks. Items will be collected at the Tournament. 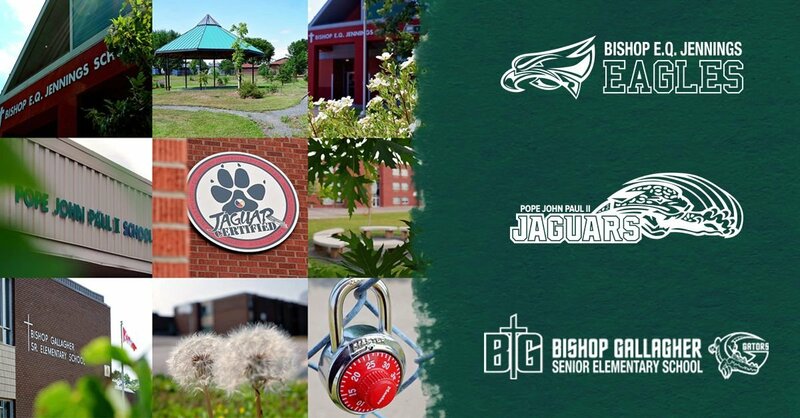 Our Senior Elementary Schools (grades 7-8) will be holding open houses on Wednesday, February 27th at 7:00 p.m.
Come Visit Bishop Gallagher Senior Elementary School, Pope John Paul II School Community and E.Q. Jennings. Learn more about our schools, our staff, our programming and what to expect next year! 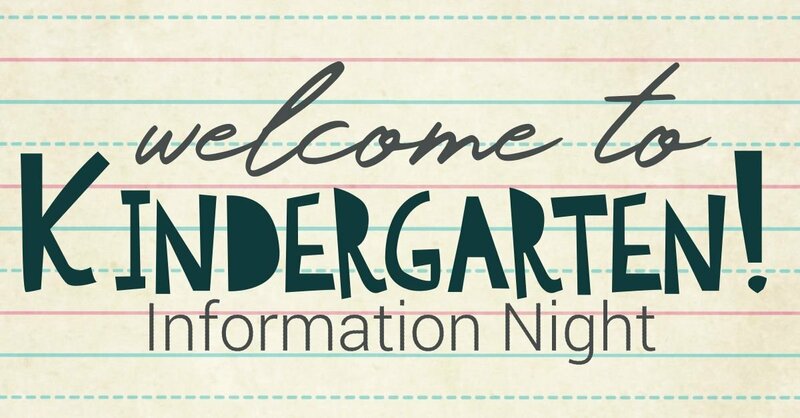 Join us for an Informative and Fun evening at our 2019 Kindergarten Information Night! With Christmas come and gone here are some of our December Highlights! Special thank you to all of the students who generously gave their cards to the St. Joseph's Foundation of Thunder Bay! Advent, merriment and Christmas Cheer! Thank you to each and every school that participated in Advent masses, crafts, singing, productions and raised goods and funds for Christmas Cheer. Here's a small video to highlight the good works happening within our school communities. SHSM (Specialist High Skills Major) grade 11 & 12 Students in Mr. Verardo's Building Construction Class have been up to something, pretty cool. 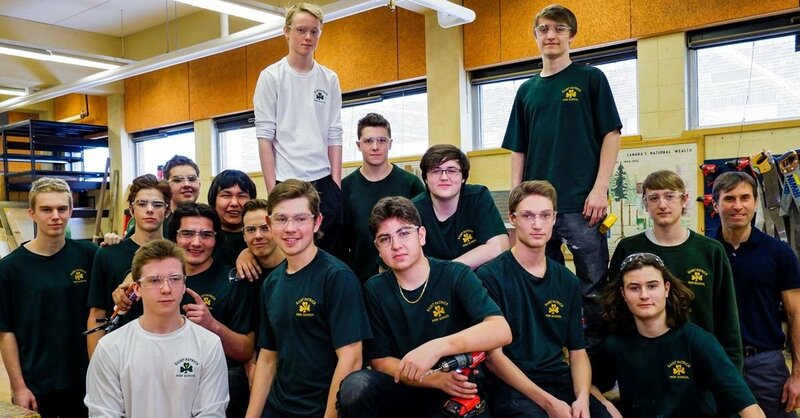 The St. Patrick High School Saints have been busy building Playhouses, which will be raffled off at the Spring Home & Garden show, with proceeds being donated to the Children's Centre Foundation Thunder Bay! These talented students had the opportunity to design the playhouses from scratch, utilizing their construction, math and communication skills. Great teamwork all around - we loved the Fireplace, pallet ceilings, whitewashing, and nautical style outdoor railing. Each house is unique, well constructed, and beautiful! Congratulations to Pope John Paul II school in capturing Gold and Silver at the Skills Ontario Regional Cardboard Boat Racing Competition held at Lakehead University on Tuesday, November 27th. The competition saw an amazing 37 teams compete all the way from the Manitoba border to Nipigon! Our teams from Pope John Paul II, Bishop Gallagher and Bishop E.Q. Jennings displayed exemplary teamwork, collaboration and sportsmanship in representing themselves and their school. All schools built and designed 7 amazing boats. In just 2 hours, students used their math, science and technology skills to build a boat using cardboard and duct tape only. 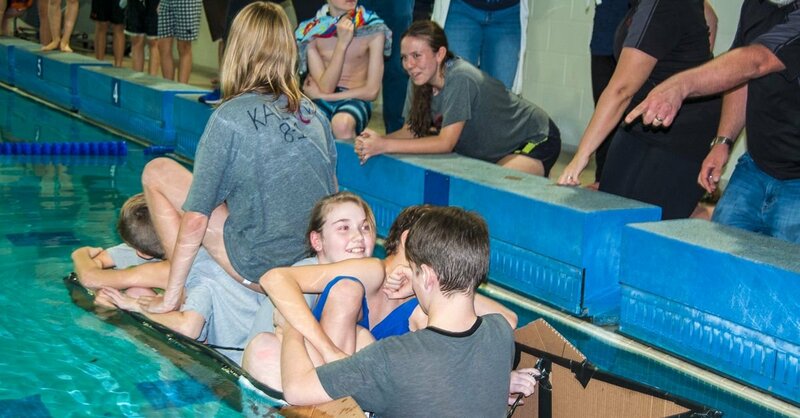 The 3 boats representing Pope John Paul II were not only strong and fast for the race portion of the event, they also held a minimum of 6 students, with one boat holding a whopping SEVEN STUDENTS and a total weight of 646 pounds! A special thank you to all our coaches and staff for their amazing support to our teams. The team consisting of William Seaberg, Jackson Glover, Gavin Drebit and Nicholas Lento received the SILVER medal and the team consisting of Anders Sandberg, Emily Craig, Melissa Otto and Lucas Riley received the GOLD medal. Students in Mr. Opaski and Mr. Rybar's Religion classes have been busy making fleece blankets as a Christmas present to Fay Peterson and Shelter House Thunder Bay. 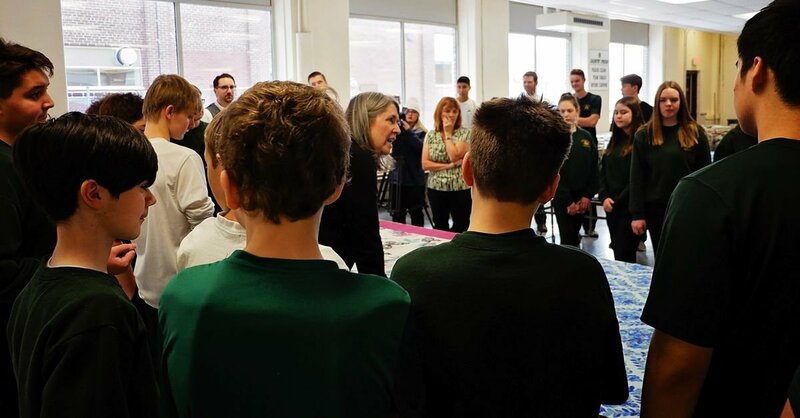 This community based learning activity is a way to give back to the community, and provide the students with a new skill and learning initiative. Special thank you goes out to the volunteer team who came out to help the students with their blankets. We'd also like to say "Hi Mom!" to Mr. Opaski's mother, who assisted in this amazing project. 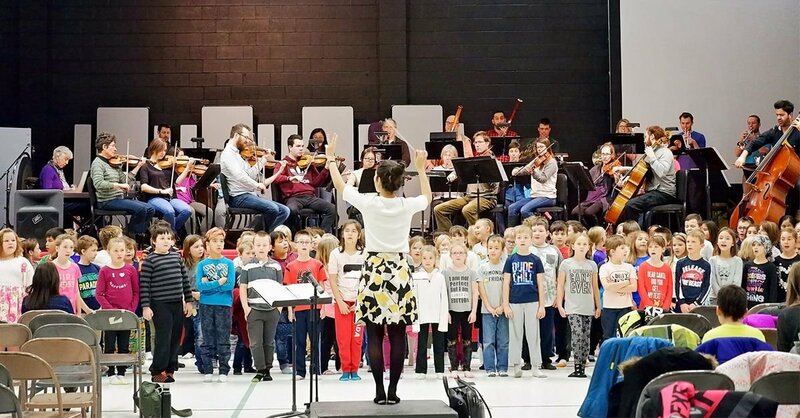 Grade three students from across our Board, along with Lakehead Public Schools have had the amazing opportunity to sing with the Thunder Bay Symphony Orchestra! 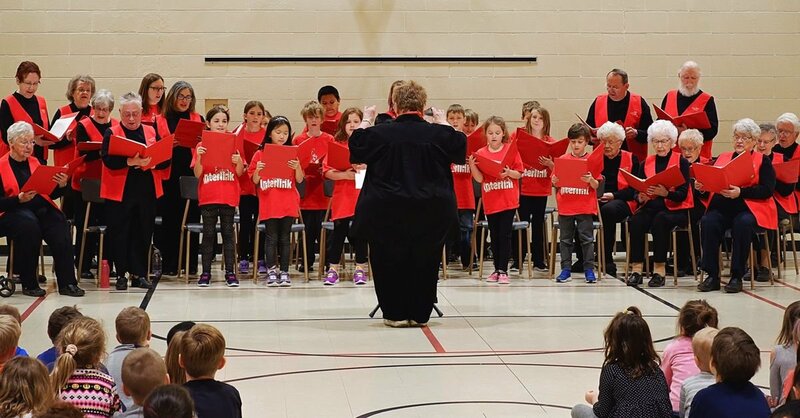 Last Friday, students from St. James, Claude E. Garton, Woodcrest, St. Paul, St. Margaret Elementary School and Our Lady Of Charity Elementary School rehearsed together at Ecole Gron Morgan Public School. Throughout the beginning of November, TBSO resident conductor, Mélissa Biroun, visited classrooms preparing the students for their concerts. Students have been practicing simple folk songs as well as the songs: Viva la Musica, the Ode to Joy chorus and The Spirit Bear Song. A final performance will take place tonight at Ecole Gron Morgan Public School at 7:00 p.m. with St. Bernard Elementary School, St. Pius X School, Corpus Christi and Nor’westerview students singing. Thank you so much to the Thunder Bay Symphony Orchestra for this amazing opportunity and to Ecole Gron Morgan Public School for your generous hospitality and warm welcome from your staff and students. 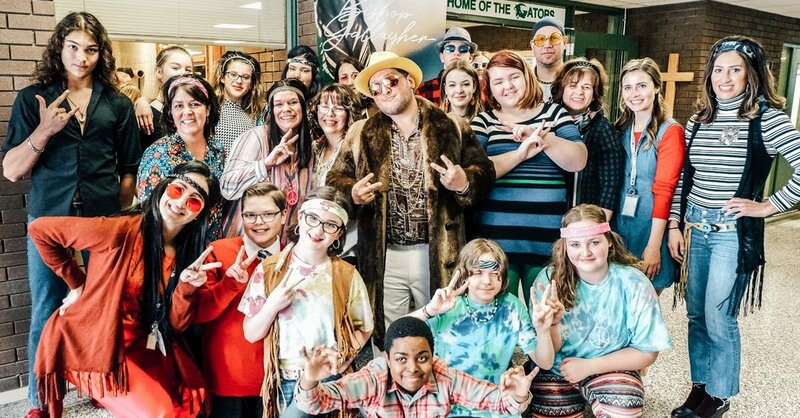 Students and staff wore whatever best represented who they are and what they're comfortable in, celebrating their individuality! Because, being YOU and being true to yourself is what matters. We discovered a variety of costumes/clothing ranging from dinosaur and christmas tree wear to construction workers, Habs fans *cough* cough* Mr. Ianni* princesses, superheroes, wolves, unicorns and cat ears. The most popular look was the Sears loungewear collection; consisting of housecoats, pajamas, sleep masks and of course the ever trendy, athleisure fashion. 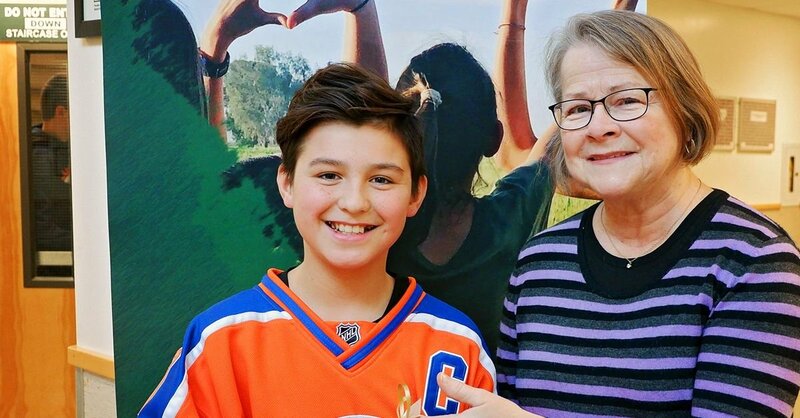 As part of this initiative to help promote safe schools and positive learning environments, students and staff participated in several events this week to bring recognition to the importance of inclusivity and togetherness. Did you know that November is also Indigenous Peoples Awareness Month? Our friends from Biwaase'aa were at the school today to facilitate the very FIRST Holy Cross Powwow in celebration of cultural awareness and fellowship! It was an amazing day for students and staff, who all wore their school colours in support of anti-bullying awareness prevention week! 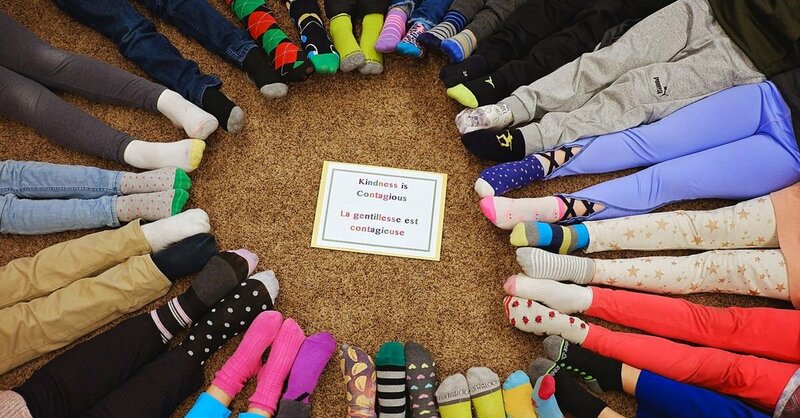 With Bullying Awareness Week taking place, the Flames theme has been: Kindness is Contagious! 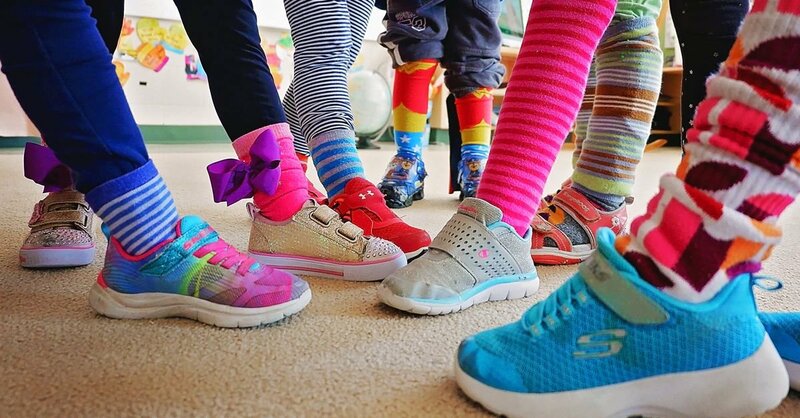 The idea behind the mismatched socks is to celebrate that each of us are all unique and different in our own way and that's OK! 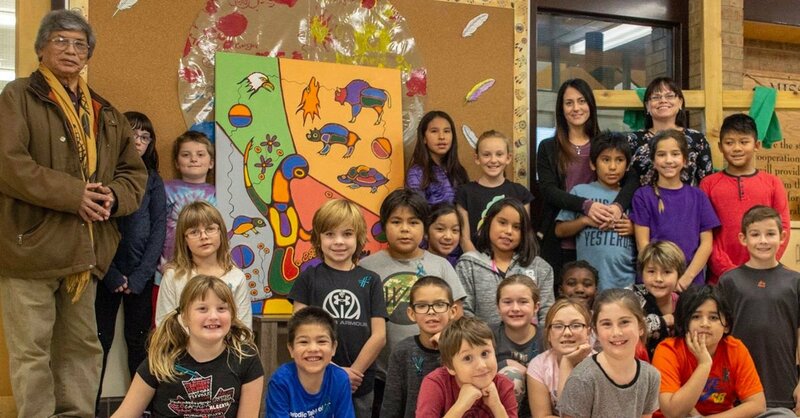 With the assistance and guidance from Woodland artist, Goyce Kakegamic, students of St. Vincent School created a Seven Grandfather Teachings painting last spring. Today the painting was officially unveiled with Mr. Kakegamic and members of the school community present. 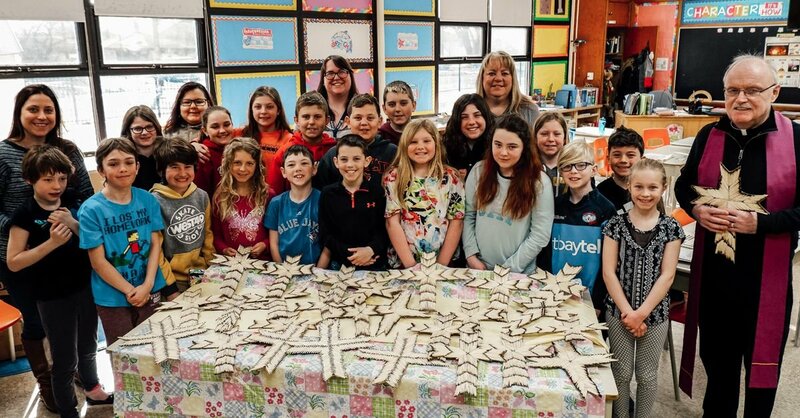 Past students in Mrs. Piccinato’s class and Mrs. Deleo’s classes created the art, inspired by the teachings and as a way to create stronger ties with the Indigenous community. Funding through a Tbaytel grant made the mural possible; fostering arts, culture heritage and education. St. Margaret Elementary School held a beautiful Remembrance Day Service in their school gymnasium on Friday. Piped in by Mme. Chlebovec of the The Macgillivray Pipe Band of Thunder Bay, WO O'Connor and students of the Colour guard entered the room. Father Ciarán Donnelly began the morning with a prayer, highlighting the virtue of peace. 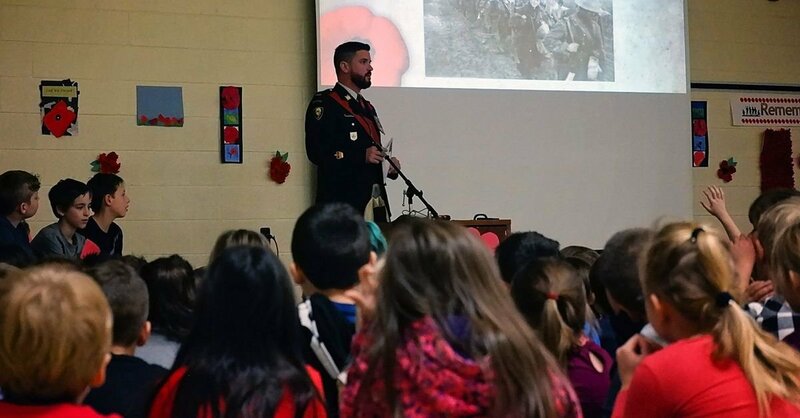 Warrant Officer Jon O'Connor from the Lake Superior Scottish Regiment paid a special visit to the school to speak with the students. He touched on the 100th Anniversary of WWI ending and the history it played within our city and our Armoury. As part of his presentation, fitting to the St. Margaret community, he discussed his time in Afghanistan, while serving with his friend, Tony Boneca. Corporal Anthony Joseph Boneca was a student of St. Margaret who gave his life for all Canadians while he was serving in Afghanistan in 2006. Following WO O'Connor's presentation, staff and students held a touching Remembrance Day service, complete with the singing of the nation anthem, prayer, readings, poems and songs. Thank you to the entire staff for their tireless effort in creating a touching tribute and service of remembrance. 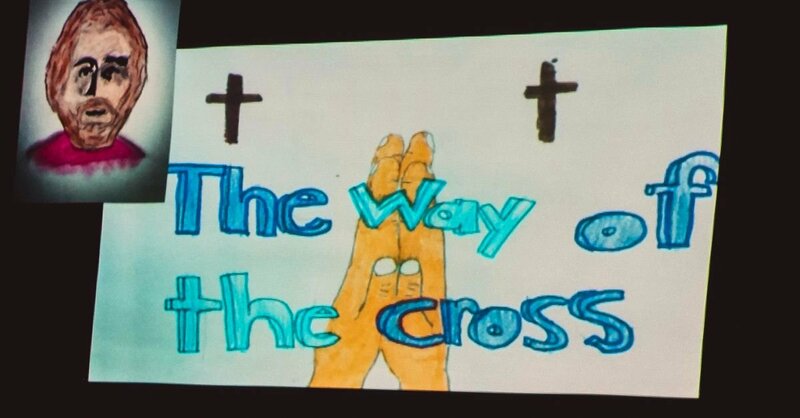 Special thank you to the students, who were extremely respectful and calm throughout the presentation and service. Thank you Warrant Officer O'Connor for spending your morning with us. We're glad you're a St. Margaret Kindergarten Alumni! To commemorate the 100th Anniversary of the end of the First World War, students in Mr. Biesenthal & Ms. Mason's classes could be found at the Riverside Cemetery early Friday morning. 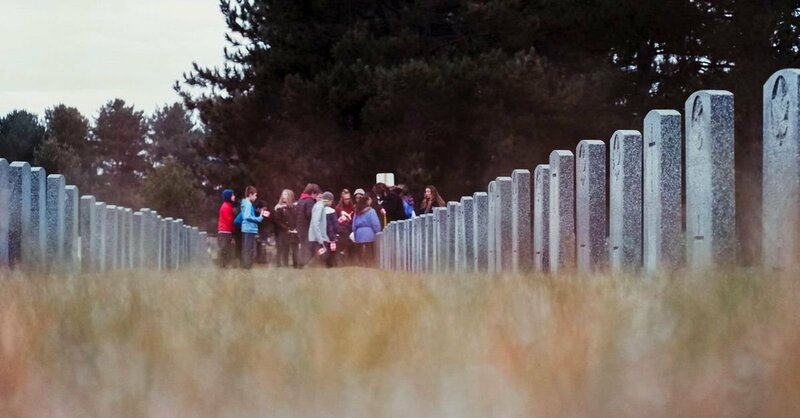 Each student placed a Canadian flag on as many WWI Veteran's graves as possible. This is a program that is encouraged by The Royal Canadian Legion Dominion Command. In addition to placing a flag at each grave, students collected data from each headstone, and are hoping to submit their results to the Legion to compile a central spreadsheet. 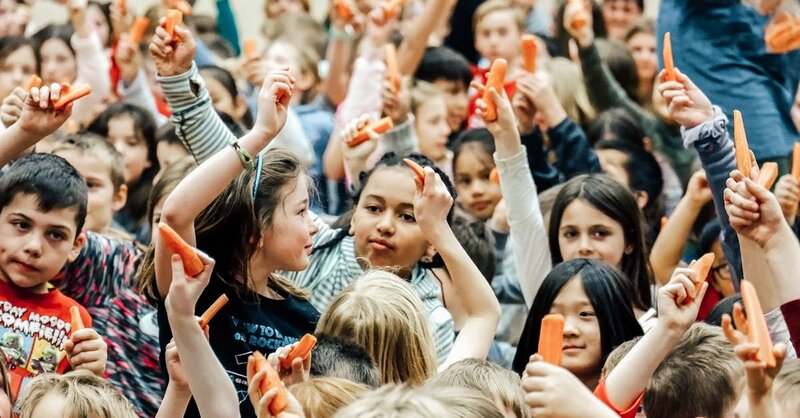 Students at Holy Family School celebrated Halloween with a Black and Orange themed assembly, and a massive school prize draw! 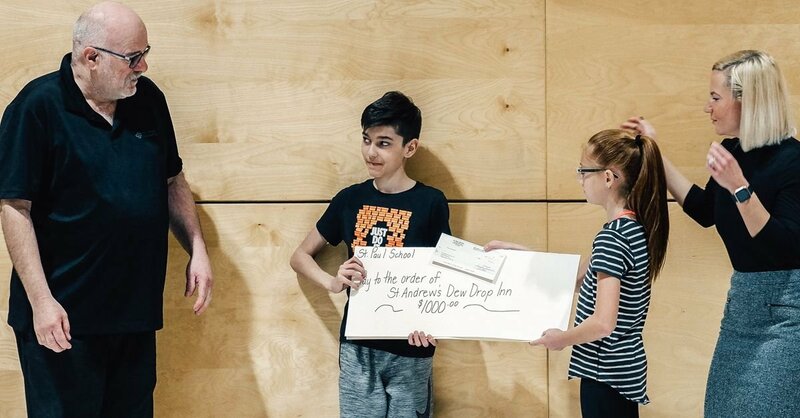 Running a hugely successful Dance-a-thon last week, students had the opportunity to raise funds and gain ballots for the chance to win some amazing prizes, including Chromebooks, watches, gift cards, and a coveted Robert Bortuzzo hockey stick. Former Holy Family Teacher, Oscar Bortuzzo was on site to present his son’s signed stick, along with St. Louis Blues hockey accessories! Robert himself sent greetings via video, which was a massive treat for the students. 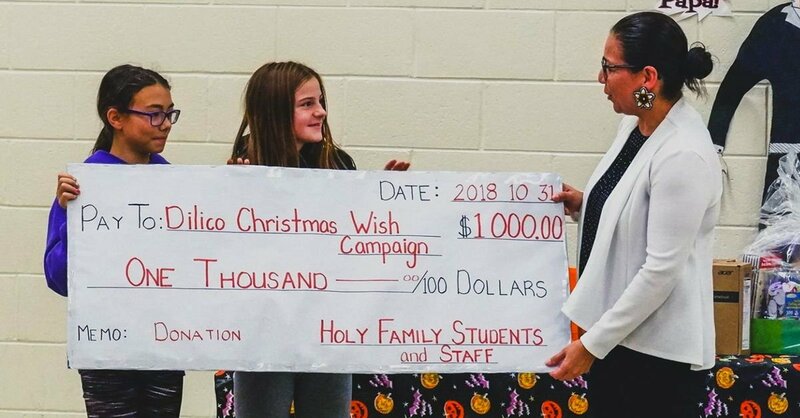 EVEN BETTER, A portion of monies raised from the dance-a-thon pledges were donated to Dilico Christmas Wish Campaign! ONE THOUSAND DOLLARS! Way to go Holy Family. We're so proud of all of you! PJP II Dress Down Campaign! Staff at Pope John Paul II School Community collected $1,780 as part of their annual Dress Down Campaign! This year, George Jeffrey Children's Foundation was the proud recipient of the PJPII Dress Down donation. Students and School Staff presented a cheque to Executive Director, Steven MacDonald this morning. 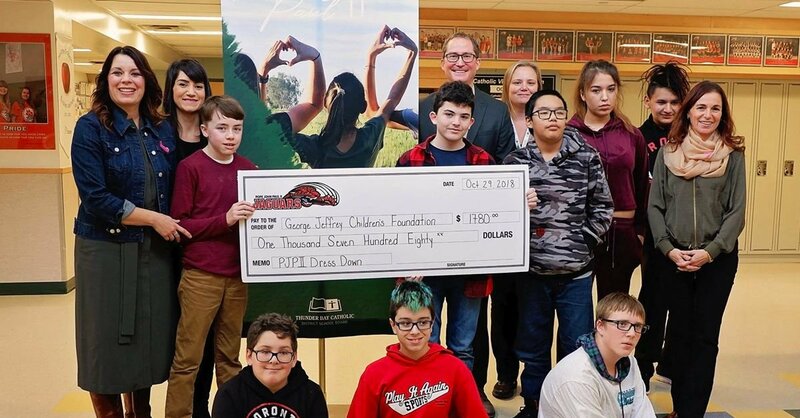 It was all smiles, donating to this enriching and amazing organization, as many students in the school are clients of George Jeffrey Children’s Foundation. Way to go Bishop Gallagher Gators! Today staff and students stepped up by wearing Purple and selling purple persians to bring awareness to Child Abuse Prevention month. 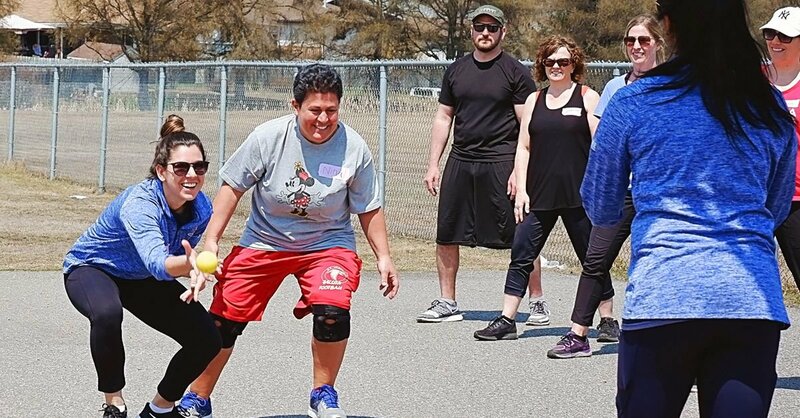 Step Up is an annual campaign held by Dilico Anishinabek Family Care and the Children’s Aid Society of the District of Thunder Bay in support of national Child Abuse Prevention Month. 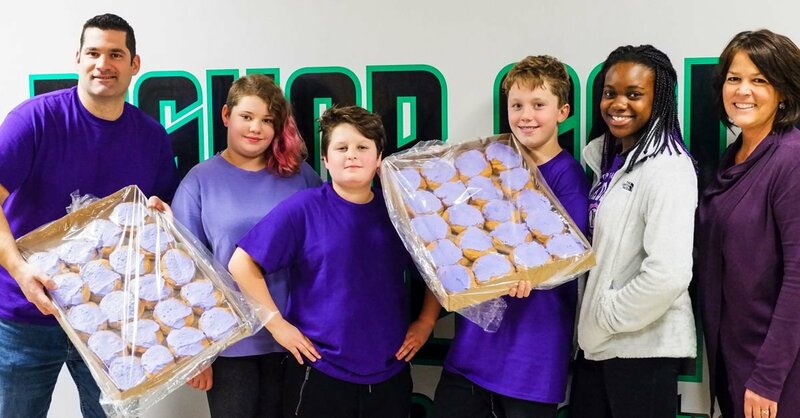 In recognition and spreading awareness, purple persians were sold, with proceeds being distributed to Beendigen Anishinabe Women's Crisis Home & Family Healing Agency. By wearing purple, students and staff show their readiness to Step Up and show children that they matter. This is the first Ministry of Education consultation on the Health and Physical Education curriculum, Math curriculum and other important school issues. To participate, you must register by 4:00 p.m. TODAY (Thursday) . Space is limited and will be filled on a first come first served basis. If you are able to participate, you will be given connection instructions. 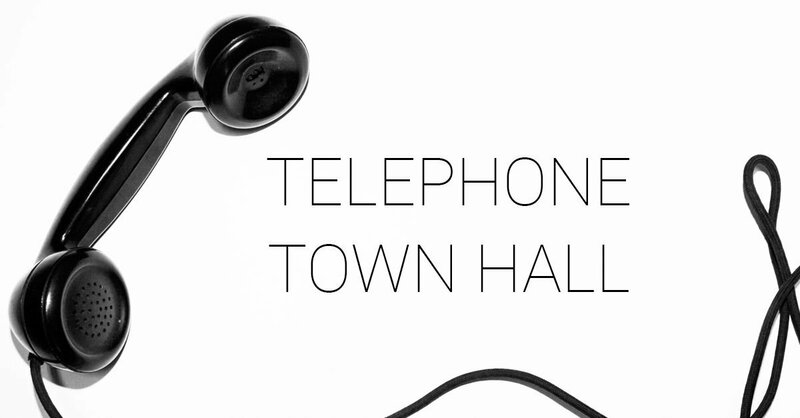 The next telephone town hall is scheduled for Wednesday, November 14 from 6:30 – 8:00 p.m. Registration for this Town Hall will close on Tuesday, November 13. 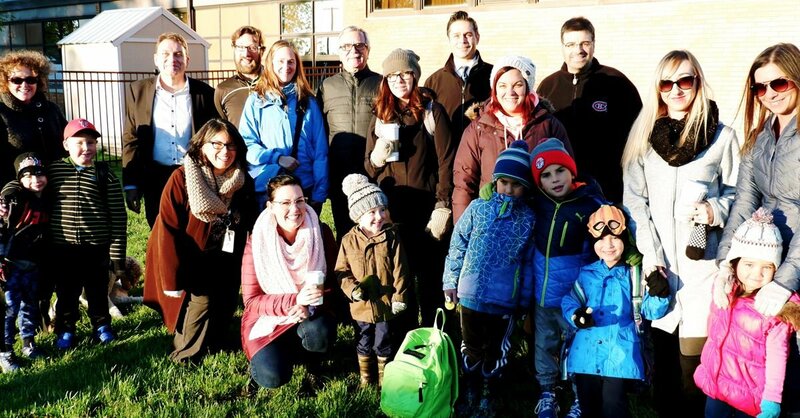 The walk, led by Mr. Kolic, began at Safeway where students along with parents, guardians, staff and Principal, Mr. Frank Lacaria walked to school together. Special guests today included Director of Education, Pino Tassone, Chairman of the Board, Bob Hupka, Craig Murphy, Student Transportation Services of Thunder Bay, Councillor Shelby Ch'ng, & Mrs. Stasia Starr, Health Nurse and April Hadley, Health Promotion - Thunder Bay District Health Unit. Students, along with parents and guardians are encouraged to walk to school throughout the month of October, promoting healthy and active lifestyles while being environmentally friendly. Walk to School Month is delivered by Walk Or Wheel Thunder Bay, through EcoSuperior. This project is made possible through financial support from Green Communities Canada and the Government of Ontario. Thank you to everyone who came out today! Student winners were surprised by Mr. Rusnak, who hand-delivered prizes to the winners, along with an assortment of prizes for the rest of the students. These creations will be featured on cards and calendars - traveling worldwide. Mrs. Mallek/ Mrs. Barrett‘s Grade 1 class. What a great way to end the school year. Thank you Don Rusnak Member of Parliament for traveling all over the city today to make this so personal! Through their outstanding generosity, St. Jude surpassed their fundraising goal, raising approximately $2,300. These funds will be put towards the purchase of iPads to assist residents to communicate with their families, play interactive games and be connected to news and events. As a thank you, St. Joseph‘s Foundation treated the entire student population to a popcorn day at the school. Further, the top six fundraising students were invited to a pizza and ice cream party with the residents of Hogarth Riverview Manor today! “St. Joseph‘s Foundation is overwhelmed with the generosity of the St. Jude students. The pizza party celebration is to recognize those individuals who did so much for our clients, and allow them to meet the residents personally that will be impacted by their efforts.“ says Katrina O‘Neill, Executive Director, St. Joseph‘s Foundation. Thank you so much for the great lunch, and the great company to share it with! 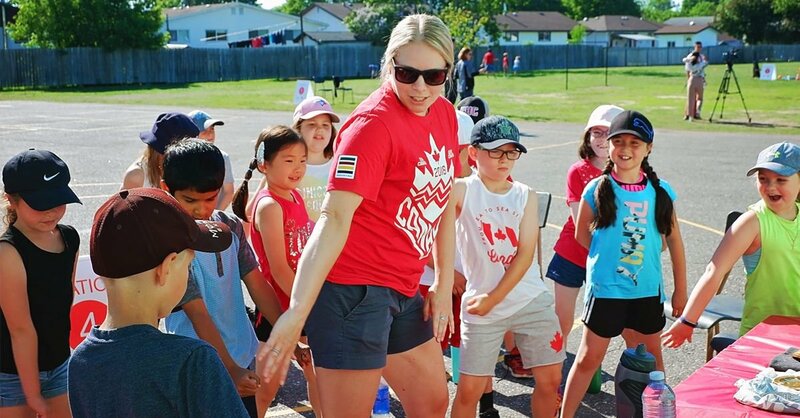 Schools across Canada participated in a challenge to show Canadian Tire how they get active for a chance to win an Ultimate Play Day, with a visit from an Olympian - who happened to be our very own, Haley Irwin!! St. Francis enjoyed a day of fun in celebration of their success. 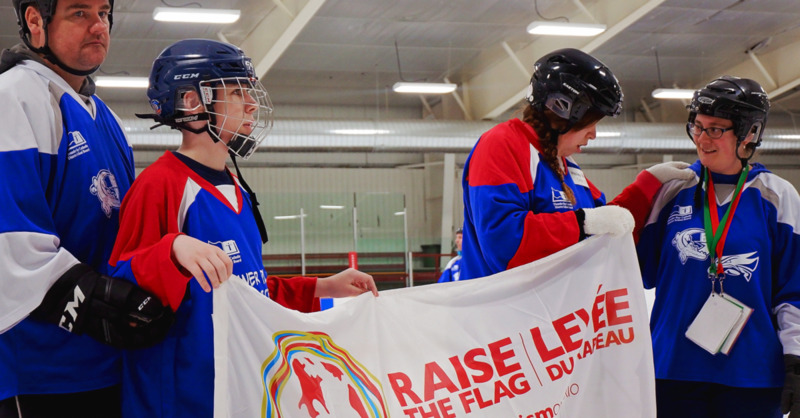 The Hero of Play program was created to motivate and celebrate individuals who make physical activity a priority. Thank you Canadian Tire and Haley Irwin for this amazing day. 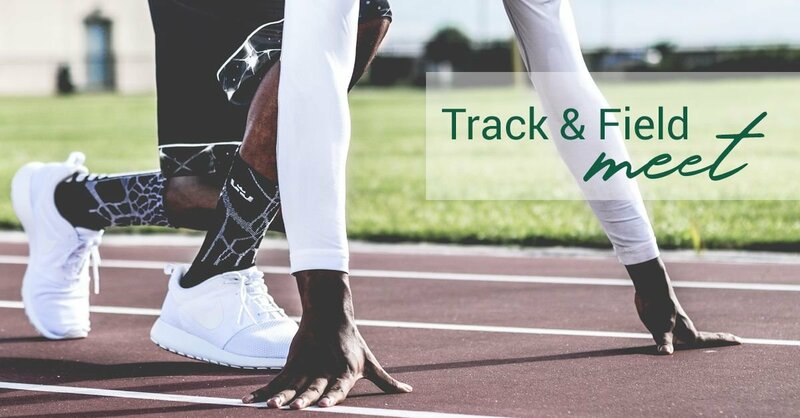 Check out this year's TBCIA 2018 Track and Field Meet Schedule, click here to download. Learn more via the NWOSSA Track and Field Site, here. Students & staff from St. Francis School surprised their Principal, Mrs. Taylor. Mrs. Taylor implemented many healthy initiatives throughout the school, including a brand new track in the school yard. St. Francis School has received a Gold standing in Ophea’s Healthy Schools Certification because of these wonderful healthy and active implementations. In honour of her efforts, the students unveiled a plaque next to the track to Mrs. Taylor as a retirement surprise! Happy Retirement Mrs. Taylor! We love that you began the story of your teaching career at St. Francis, and will finish the last chapter of your career as a Principal at this same school. 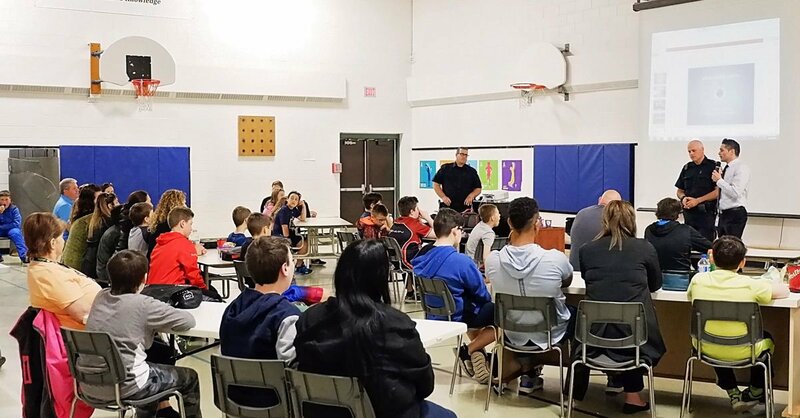 St. Thomas Aquinas hosted an amazing presentation by Constables, Grieve and Saunders from Thunder Bay Police Service on the importance of social media and safety. This lunch and learn was awesome, as it brought grade six students and their parents to learn, together. "Not feeding the Trolls" aka, not responding to harassing comments, and messages. Learning to screenshot and block to avoid further issues. Knowing when to put the device down, and when to talk to a trusted adult if any harassment arises. This presentation was relevant to everyone, students and parents. Thank you for sharing your knowledge and stories from a policing perspective. 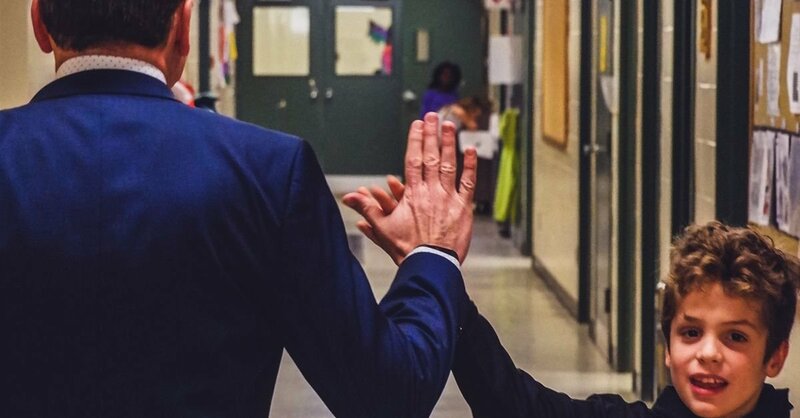 This week Ontario is celebrating Policing and Community Partnerships! It's National Police Week. 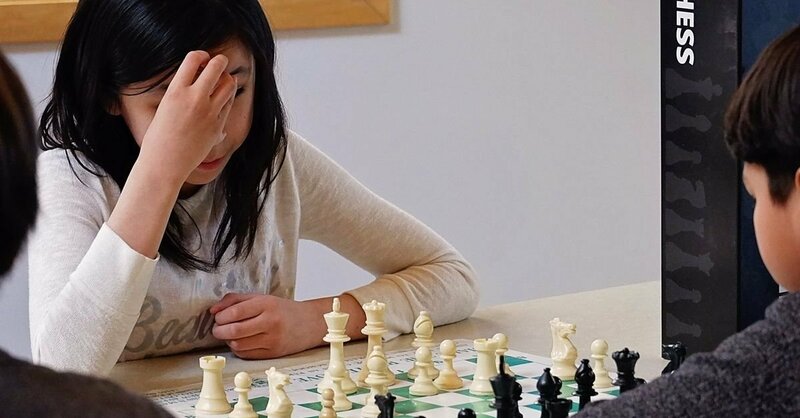 Players from K-6 gathered at Our Lady of Charity to test their strategy and problem solving skills. They also had the opportunity to connect with other students from TBCDSB, fostering community and friendship. Way to go staff and students. What a great way to kick off the week! The full day Professional Development Session at Our Lady of Charity School gave instruction on how to teach the fundamental skills of baseball/softball to one teacher from each Elementary School. The Session is in conjunction with the Toronto Blue Jays and MLB. 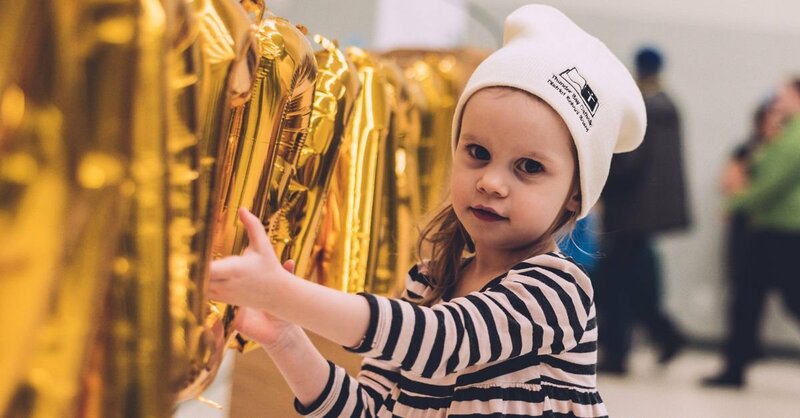 It is the Jays Care Foundation's mission to use baseball to teach life skills and create lasting social change for children and youth across Canada. The Teachers hope to facilitate a Board level baseball/softball tournament in early October. 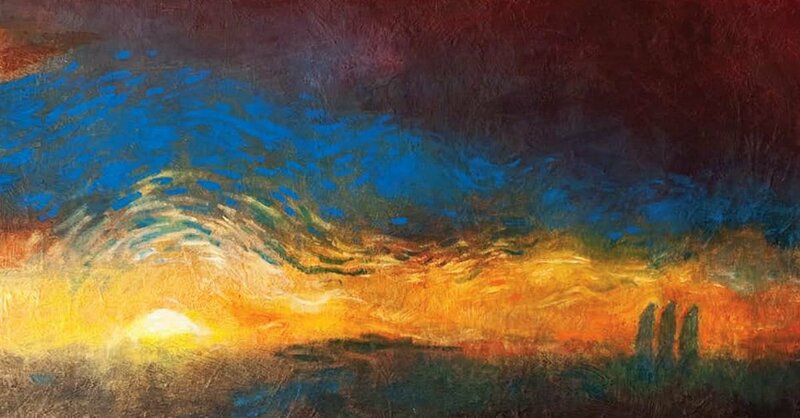 Renewing the Promise: A Pastoral Letter for Catholic Education/ Renouveler la promesse Lettre pastorale. Our Catholic schools offer an extraordinary contribution to the social and environmental fabric of our society and world. In partnership with parents, who bear the primary responsibility for the education of their children, all those who work in Catholic education are called upon to reflect, in a faithful and discerning fashion, God’s presence in this world. 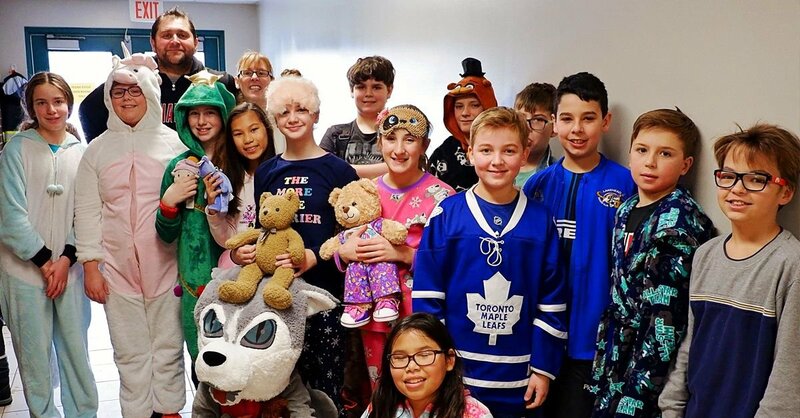 Students from Holy Cross Elementary School participated in Project Smile, an initiative created by St. Ignatius High School Thunder Bay. The grade 11 students in the Introduction to Anthropology, Psychology, and Sociology class hosted an interactive day filled with activities to alleviate stressors, anxieties and overall pressures students are challenged with on a daily basis. Project Smile aims to help young students combat and utilize coping strategies to assist in their daily lives. More photos are available on our Facebook page, here. St. Francis grade 3 students in Mrs. Lester’s class, along with their new friends, entertained us with their sweet harmony. The students and the seniors from our community have come together, creating an Interlink Choir. The concert launched the school’s Catholic Education week celebrations. Songs from Peter Pan and Sesame Street were performed, with proud parents, guardians and grandparents in attendance; not to mention the rest of the school population! Fun Fact! : Ms. Joan Krisko is not only the Interlink Choir Conductor, she is also a former TBCDSB Teacher! 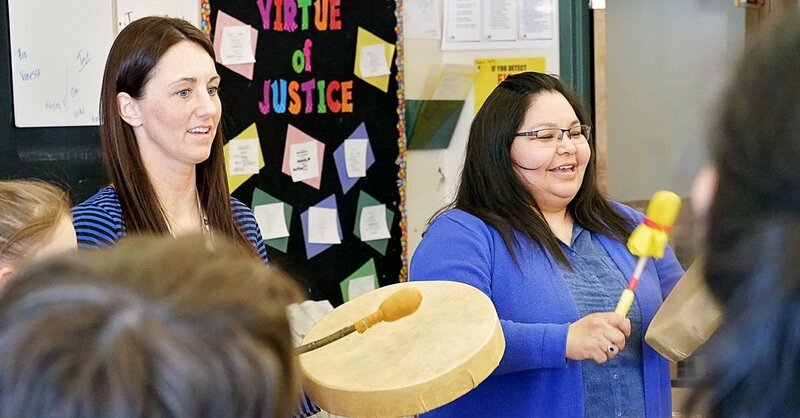 Students celebrated the completion of the Walking the Path program, which includes Indigenous teachings, highlighting culture, history, traditions and beliefs. Modules of Walking the Path included: Cultural Awareness, Seven Grandfather Teachings, Medicine Wheel teachings, history of Residential Schools, Reconciliation and Healing Circles. The Feast was a celebration and graduation of the student’s understanding and knowledge of the program and its teachings. 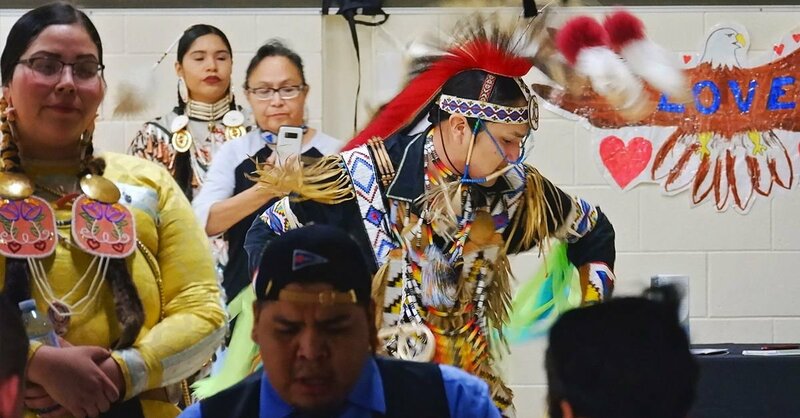 The Feast was a community gathering - Elders, Knowledge Keepers, Community Partners, Educators and Board Office Administration were in attendance. To view more photos, visit our Facebook Page. St. Francis School | 1:00 – 2:30 p.m.
Holy Cross School | 9:30 a.m.
St. Pius X | 9:30 a.m.
Corpus Christi | 1:45 – 2:45 p.m.
Our Lady of Charity | 2:00 – 3:00 p.m.
St. Bernard School | 10:00 a.m.
St. Margaret School | 2:00 p.m.
St. Jude School | 9:30 a.m.
St. Paul School | 1:45 p.m.
St. Thomas Aquinas School | 2:00 p.m.
St. Ann School | 2:00 p.m.
St. Elizabeth School | 10:00 a.m.
St. Vincent | 2:00 p.m.
St. Martin School | 1:30 p.m. Sudden tragic events involving children and youth who are connected to confirmed or suspected violence or suicide can impact a community greatly and receive wide attention. Social media and other types of media can bring forward information, rumours and suspicions that can complicate grief reactions, creating confusion and fear and alter our sense of safety and security. Below are a series of tips to assist parents and teachers to help children and youth cope with high profile tragic events and maintain a sense of security. Be a good listener and observer. Let children guide you on what they need. If they are not focused on the tragedy, do not dwell on it. However, be available to answer their questions to the best of your ability. Young children may not be able to express themselves verbally. Pay attention to changes in their behaviour or social interactions. Give simple, accurate information about what happened.Tell only what you know to be confirmed. Answer questions honestly with limiting details. Invite your child to talk about the death and ask questions. Answer as best you can, using age appropriate language. Recognize that it is normal to ask questions and receiving information helps lessen fears. Normalize your child’s feelings and reactions and be reassuring.Denial, feelings of fear, guilt, anxiety, anger and sadness are all normal reactions to traumatic loss. Labelling feelings and reactions as normal is helpful. Children may be concerned about something bad happening to themselves, family or friends. Explain the safety measures that are in place (at home and/or school) and reassure them that you and other adults will take care of them. Take children’s concerns seriously andacknowledge their fears. Monitor and limit exposure to adult news of the event.Adult discussions, social media accounts, news reports, and images of a crisis or tragic event can become overwhelming, especially if heard/read/watched repetitively. Do not allow young children to watch or listen to media coverage of high profile tragic events. Older children/youth may choose to watch or listen to the news or follow information on social media, but be available to discuss what they see/hear/read and help put it into perspective. Avoid fueling rumours. Limit and monitor your child’s online activity. Think of the Internet as a physical space or world that your child enters. This world does not come equipped with adult supervision or adult controls and there are real dangers. The Internet offers graphic adult themed games, information, images or content that is disturbing and triggering to a young mind. Actively monitor, supervise and restrict your child’s travels on the Internet. A child’s brain cannot differentiate between what is real and what is not real as well as a responsible adult brain. Invite questions to ease fears. Provide an atmosphere in which children can ask questions as needed and speak freely about their fears and reactions. This may mean being asked the same questions over and over again until the child is reassured. This is normal. Help normalize reactions that you see e.g., “it’s normal to feel scared and worry after you hear about a child dying”. This gives children permission to put their feelings into words and to talk about their own internal experience. It will not harm them to let them know that you experience fear at times as well. Keep the lines of communication open. Despite your best efforts and the efforts of your child’s school, you may not be able to control what your child hears or sees. Be aware of what kind of information exchange is happening on social media or what rumors are circulating among your child’s friends and classmates so that you can be available to help put things in perspective. Make it okay for your child to share what they have heard with you. Emphasize children’s resilience. It is normal for parents to want to limit talk about death and loss out of the belief that dwelling on the topic keeps painful memories alive and causes harm. It is also normal to want to keep your children close to you and limit independence after a tragic event. However, children are resilient when caring adults and caregivers actively help them cope and manage. 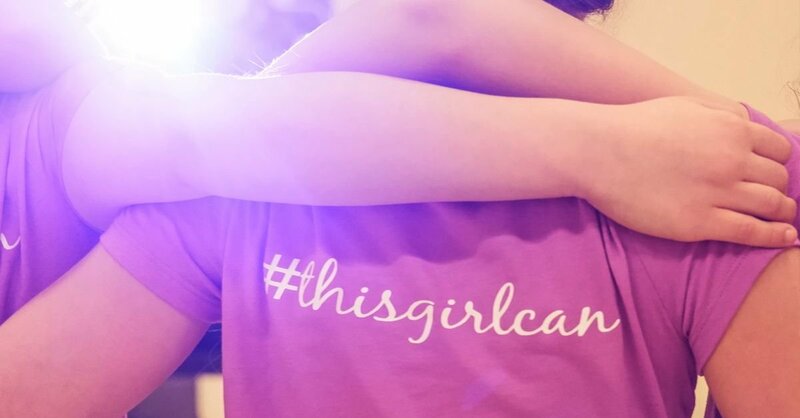 Remind your child about his or her strength and ability to cope with difficult situations. Talking and dealing directly with death, loss and fears helps recovery from grief. Suppressing talk and feelings can lead to prolonged trauma reactions. Highlight people’s compassion and humanity.High profile tragedies often generate a tremendous outpouring of care and support from around the community. Focus on the help and hopeful thoughts being offered from the community. Maintain as much continuity and normalcy as possible. Allowing children to deal with their reactions is important but so is providing a sense of normalcy. Routine family activities, returning to school, after-school activities, and friends can help children feel more secure and better able to function. Increase family time. Being with family is always important in difficult or sad times. Even if your children are not directly impacted, this may be a good opportunity to participate in and to appreciate family life. Doing things together reinforces children’s sense of stability and connectedness. Ask for help if you or your children need it.Staying connected to your community is extremely helpful and reaching out for help when needed is good role modelling for children. If you are feeling overwhelmed by your own reactions or struggling with how to support your child, call a local community counselling agency and ask for written information or resources about adult and child grief reactions, coping tips and strategies to support your child. You can ask to talk to a counselor on the phone or ask to meet in person. Communicate with your school.Tragic event teams made up of school and community counselling partners are available to support students in the event of a death within the school community. School plans focus on supporting student grief reactions while maintaining normal routines as much as possible. Parents and schools should work together to support children through grief reactions. As a parent, you can let the school know if your child is struggling and together, you and the school can plan the right supports. Be aware of your own needs. Don’t ignore your own feelings of anxiety, grief, and anger. Talking to friends, family members, members of your faith community – whoever you identify as your “rocks” in life is important. It is important to let children know if you are impacted by a tragedy and what you are doing to take care of yourself. You will be better able to support your children if you can express your own emotions in a productive manner. Locally, parenting information and support is available through: Children’s Centre Thunder Bay (343-5000), Thunder Bay Counselling Centre (684-1880) and Dilico Anishinabek Family Care (1-855-486-5036). After hours telephone support is available through the C.M.H.A. 24 hour Thunder Bay Crisis Response Service (346-8282).In a case of any emergency, call 911. The new technology, comprising of Google Chromebooks, Chromebases, and Apple iPads (for primary grades), will be supplied directly into the classrooms. Teachers and students will benefit from daily access to technology, rather than having to book technology in advance. The remaining elementary schools will be completed (Wave 2) in the 2018-19 school year. Wi-Fi improvements are also in the process, improving coverage and capacity in conjunction with the rollouts. As a Board family, we honoured the memory of the fallen Broncos. We keep their family, friends and community in our prayers. 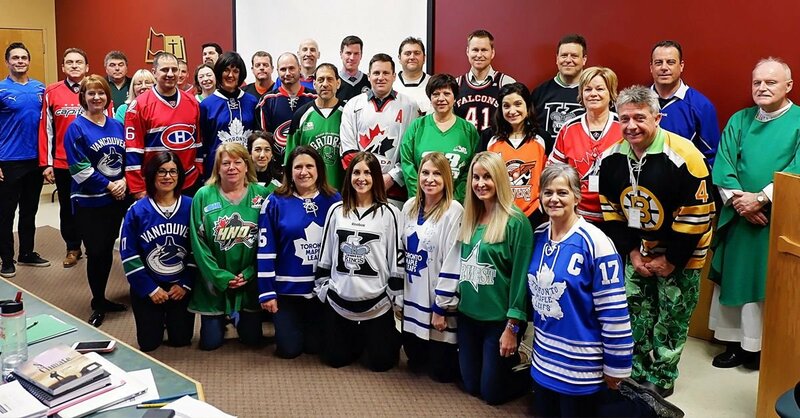 We showed our support by wearing green or a jersey. Thank you to all of our schools who participated in various activities and tributes. You can view even more photos from all of our schools, on our Facebook Page. Grade five students in Ms. Dysievick’s class at Our Lady Of Charity Elementary School participated in a healing circle Monday afternoon. Students were greeted by guest, Nicole Mckay from Kitchenuhmaykoosib Inninuwug (Big Trout Lake). Nicole lives in Thunder Bay and is the Land Base Coordinator for Keewaytinook Okimakanak Secondary School Services. Not only is Nicole an Activity Coordinator, she is also a Drum Carrier. Today she shared songs and stories with the students as part of Walking the Path. Students shared their masks they had painted on a previous day, explaining the colours, symbolism and thought behind their creations. 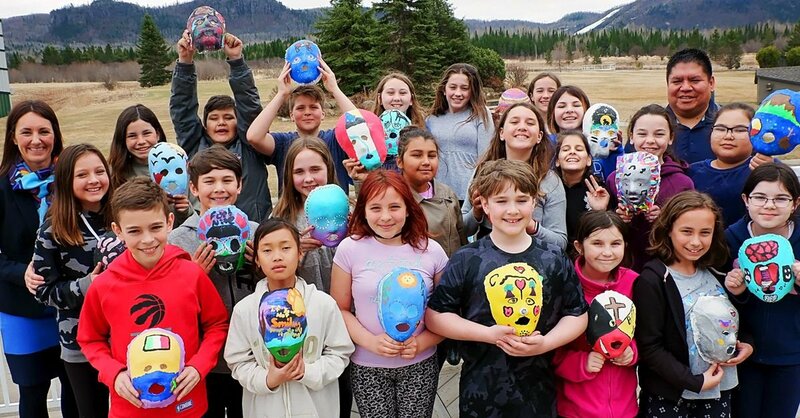 The student's masks are a reflection of who they are and where they come from. The Year Two Kindergarten students at St. Paul School held an Art Exhibit in the Library! This artwork is extremely special, as it will be delivered to Gifu Japan. 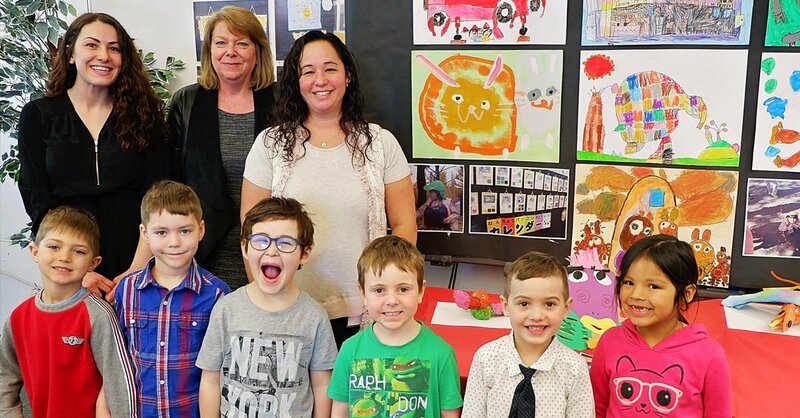 Teacher Laura Sutton and Early Childhood Educator Riley Speziale, along with their students have been working diligently in preparation for an international art exchange. Kindergarten Artwork will be exchanged with the Kaguya Second Kindergarten Students in Gifu. 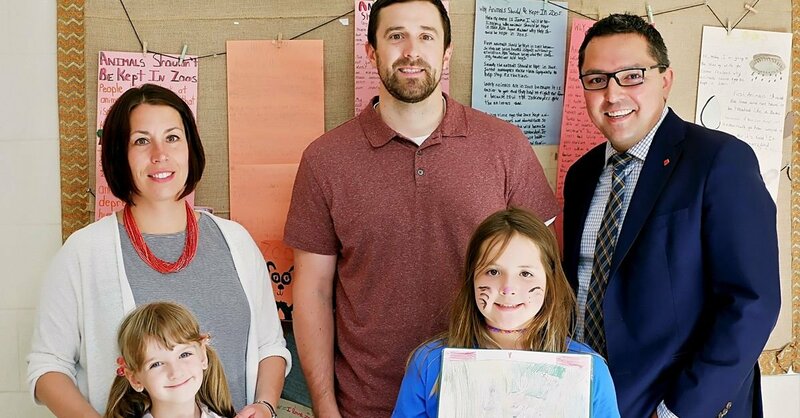 Both St. Paul School and Kaguya School will be exhibiting each other’s art as part of their international friendship and sister city connection. Way to go St. Paul School, we absolutely loved your art exhibit! St. Ignatius High School has announced their upcoming 50th anniversary celebrations! 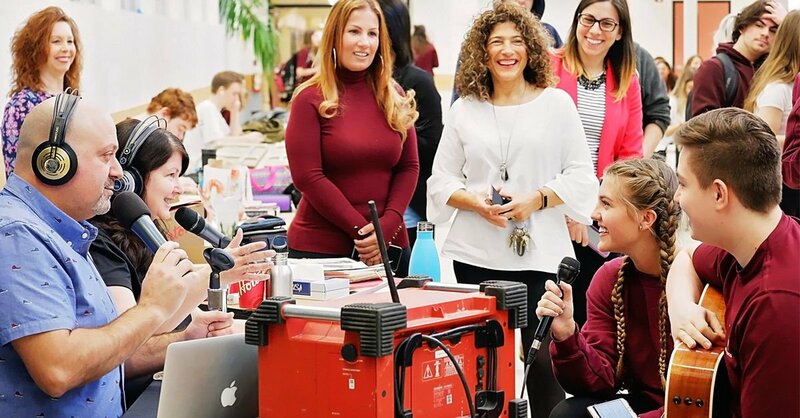 This morning, CKPR’s Morning show hosts Laura Zaina and Danny Foresta made the surprise announcement live from the School Atrium. Organizers of the anniversary found it extremely poignant to have Zaina and Foresta broadcast live for this occasion, as Foresta is a St. Ignatius Graduate. Anniversary committee organizers have an exciting evening planned with a barbeque, school tours with memorabilia on display, an alumni soccer game on the new turf and a social to follow at Tony and Adams. “This is a chance for current students and staff, alumni, retirees and anyone who was part of the St. Ignatius family to come together and celebrate. 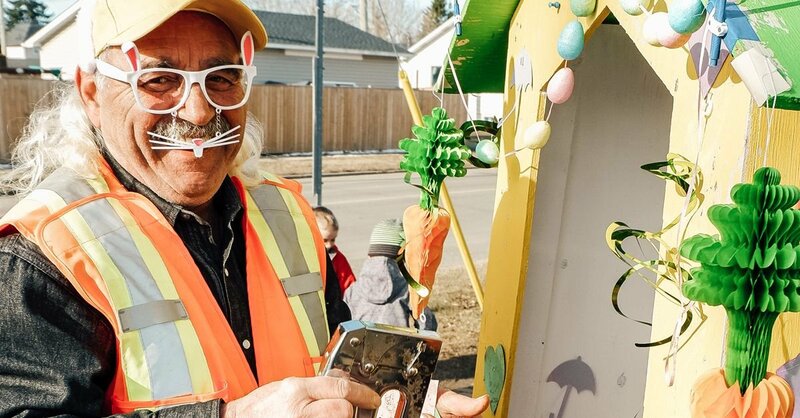 We’re looking forward to hearing people’s stories, sharing memories and enjoying the celebrations together.” Say teachers and organizers, Laura Nigro and Caterina Tolone. 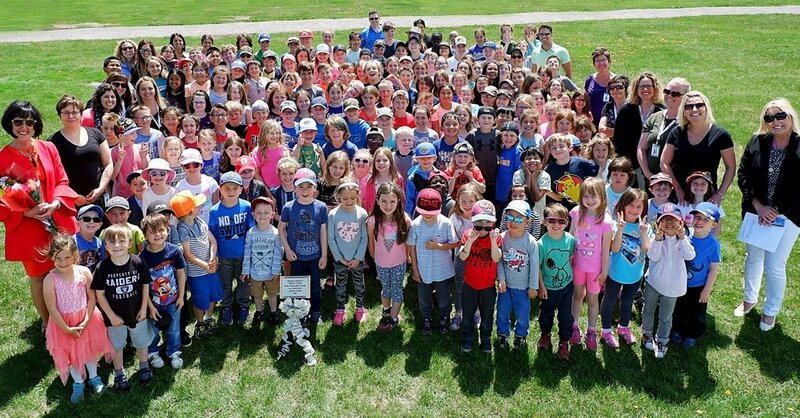 The Anniversary will take place at St. Ignatius High School on Friday, May 25th beginning at 5:00 p.m.
Thunder Bay Catholic District School Board believes that schools are the hub of communities. 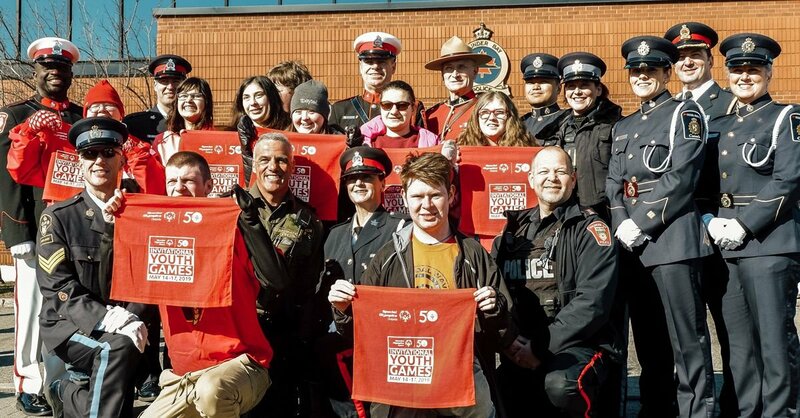 The Community Use of Schools Program offers an effective use of taxpayer investment, by providing citizens and groups with a place to come together, to volunteer, build skills, access programs, become physically active and develop strong and healthy communities. 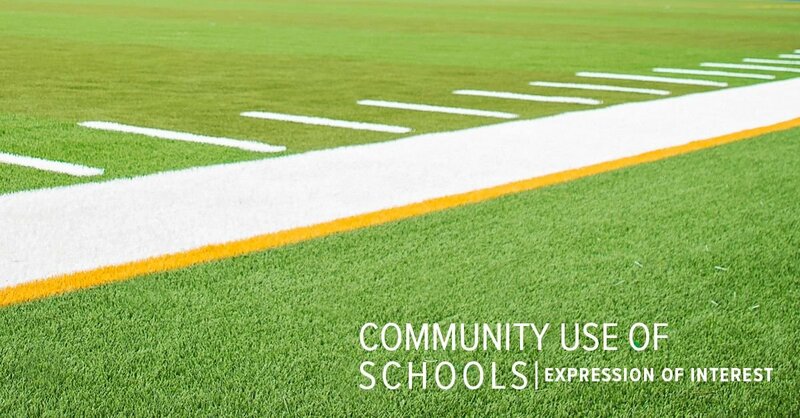 To learn more, and access the Community Use of Schools Expression of Interest Form, click here. 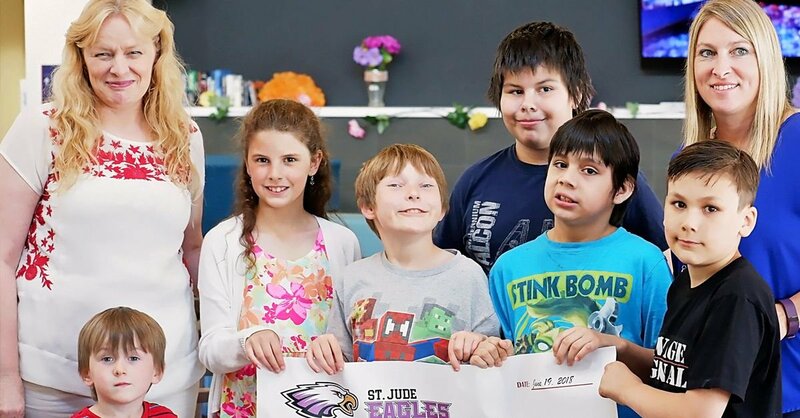 Within the last four years, St. Martin Catholic Elementary School has raised the bar and increased their literacy scores for students with an Individualized Education Plan (IEP). This year, the school has been recognized by the Education Quality and Accountability Office, as a recipient of the Dr. Bette M. Stephenson Recognition of Achievement Award. EQAO results from recent years identified various schools that demonstrated continuously improving percentages of students with IEPs meeting the provincial literacy standard, with St. Martin being one. Principals and Educators at St. Martin have successfully utilized data to foster a culture in which students receive the support they need to succeed. Together they continue to work with their students, assisting them in areas of reading and writing – an overall emphasis on literacy. 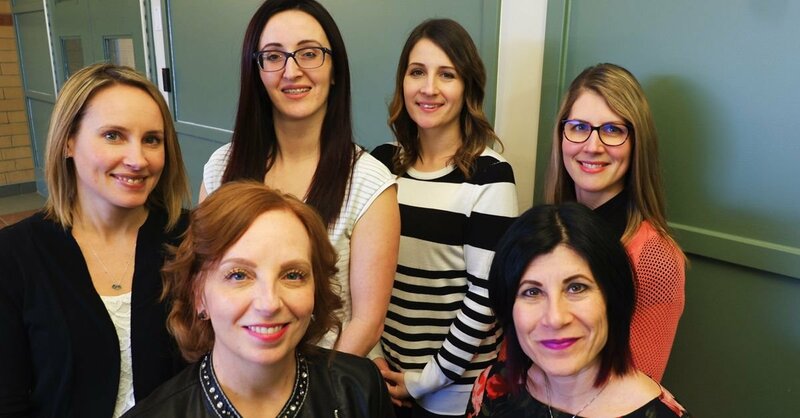 Principals Letizia Tremonti and Alma Provenzano along with Teachers Michelle Lemmetty, Maggie Redfern Pucci, Christine Traer and Michelle Gale have been invited to the EQAO Forum this week in Toronto, where they will receive their award. They will also have the opportunity to join interactive workshops and presentations, which further their understanding of utilizing data to advise constructive change for students across the country. 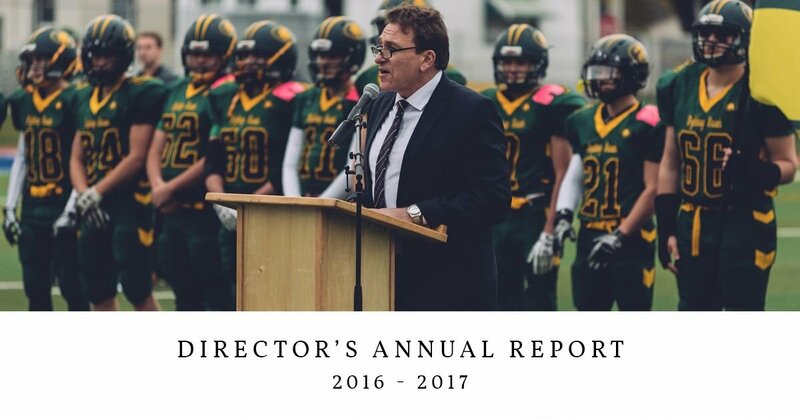 Our Director's Report is available now! Click here to view. 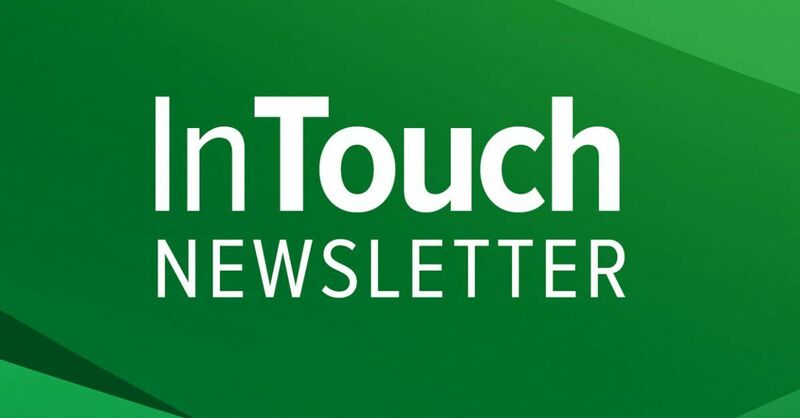 Please read the December edition of In Touch. An update from the Board Leadership team. 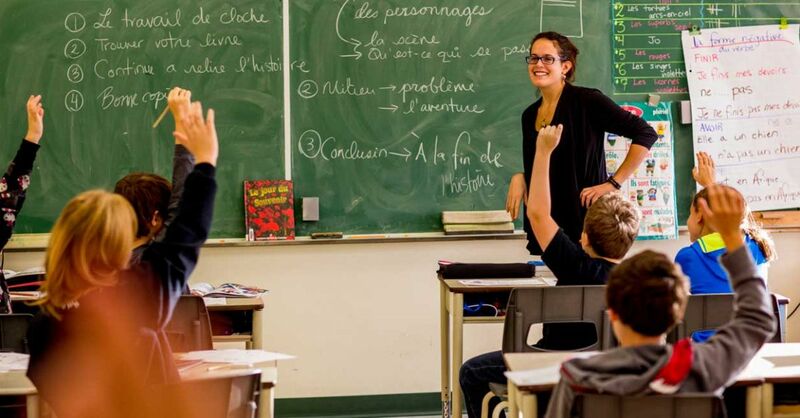 Why choose a Thunder Bay Catholic School? 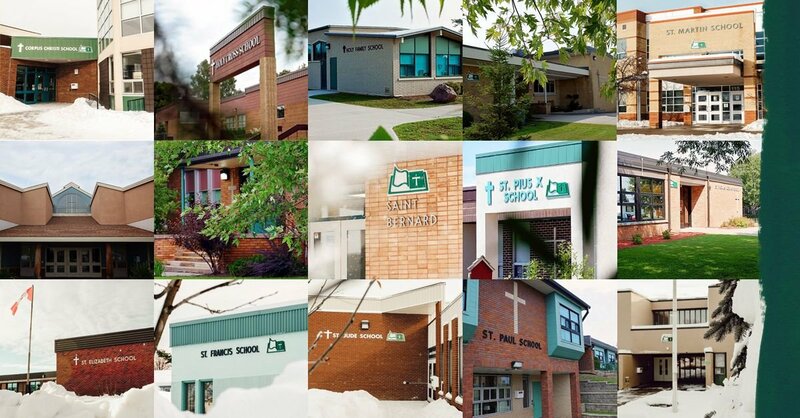 Catholic schools are a successful part of publicly funded education in Ontario. 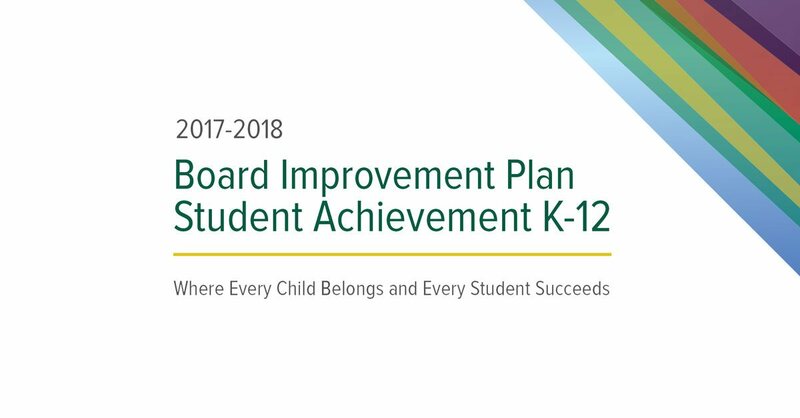 Our schools and school boards consistently meet or exceed provincial expectations in student achievement, program delivery, class size and character development. 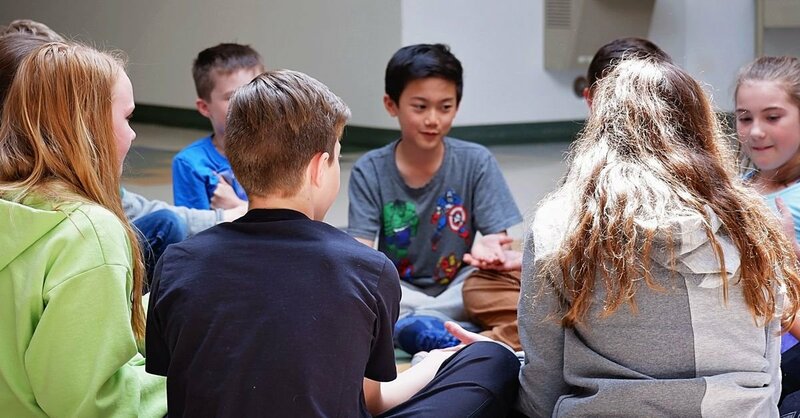 Our curriculum is purposely designed to produce graduates with good moral character who are responsible citizens, caring family members and collaborative contributors to the common good of Ontario's society. These are values that we celebrate and share with all Ontarians. They say it takes a village to raise a child. In this case, it is taking the efforts of an entire region to address a very serious issue in our schools. 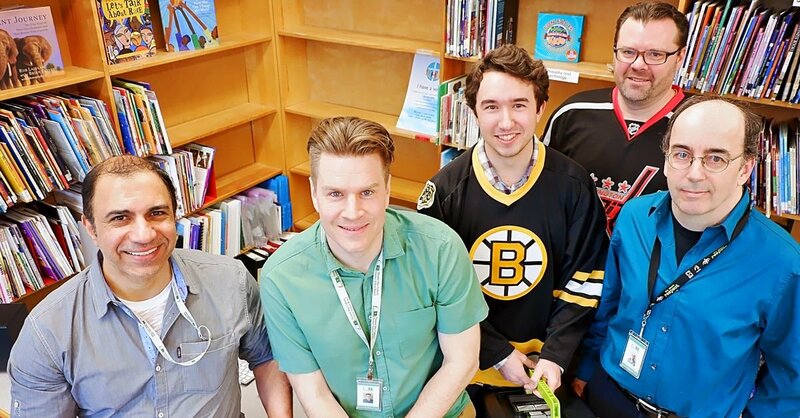 Eight district school boards in the Thunder Bay Region are working together to address a problem that is having a profound effect on student achievement – persistent student absenteeism. The “HERE” attendance campaign was launched at the Spring meeting of the Northern Ontario Education Leaders (NOEL) on Tuesday, May 9. The campaign was designed to build awareness around the attendance issue in Northwestern Ontario and to provide communications support tools to Boards and schools to help improve attendance. According to data collected in the 2013-14 school year, students in the Thunder Bay Region (from Kenora to Manitouwadge) had the highest rates of persistent absenteeism in the province. Students are considered persistently absent if they miss 10% of the days they were expected to be in school. In the Thunder Bay Region, the rate of persistent absenteeism was 21.6%. A recent study, Every School Day Counts: Persistent Absenteeism in Ontario, 2016, indicates students who miss an average of two days per month in elementary school stand a 60% chance of dropping out in grade nine, potentially impacting their opportunities for success in the future. Persistent absenteeism is a multi-faceted issue that affects diverse groups of students and families. In order for solutions to be effective, they must be focused towards sparking action amongst key influencers including students, parents, school, staff and the community at large. The HERE website will also provide background information on the issue of persistent absenteeism, guidance on how to use the resources, a section for school staff to share best practices on improving attendance and a section where school staff can receive answers to questions about the HERE campaign. In addition, each NOEL Board will receive a special Here Toolkit Box containing posters, buttons, jump drives loaded with resources including the video and special HERE lanyards. Catholic education addresses the search for meaning and the desire of the person to understand human life as an integration of body, mind and spirit. Rooted in this vision, Catholic education fosters the search for meaning as a lifelong spiritual and academic quest. We are committed to building equitable, inclusive and engaging environments in which all students have the opportunity to learn. In classrooms, this is expressed through the inclusion of every learner, using differentiated instruction and student voice as well as culturally sensitive models of pedagogy and assessment for learning.